Electricity is an input in virtually everything we do as a modern society. Few Americans remember what it was like to live without it and its attendant benefits on quality of life, labor productivity, and human health. Electricity is today largely taken for granted, yet for middle-class and older Americans utility bills often constitute a significant share of household expenses. In the manufacture of everything from aluminum to silicon to chemicals, electricity is usually the largest operating expense; for many other manufactured goods, it is second only to labor. The trade in electricity exists at the intersection of society’s demand for the product’s affordability and constant availability. Obtaining one of these two inverse variables means trading off the other. Yet the electric sector has become still more complicated in recent decades, with the addition of environmental and social considerations from emissions and land use to employment at power plants and mines. These demands do not coexist easily, and they never have. Conflicting policy demands have meant the heavy involvement of government in this sector, ever since its origin. Electricity has never fit the paradigm of business versus regulation. As has been since the case since its earliest days as a commercial product, it is often sold by monopolies at prices fixed by government, both in Washington and at state capitals. The utility sector clamors for government’s involvement in its business decisions, and government is happy to oblige. As a result, few products are regulated in such a command fashion as electricity in our supposedly free market society. Understanding the sector is not just important because electricity is important; the market for electricity is really a window into the workings of the modern administrative state. The economic regulation of the sector often blurs the line between government and business, turning each into the other’s client. Even in places where competitive features exist, the marketplace is still designed by government and warped by subsidies. Today there is no genuinely free market for electricity. Ironically, many of the ideologically driven, market-oriented reforms of recent decades have precipitated a retrenchment of the monopoly problem they intended to solve. Reforming the market for such a fundamental consumer good is not impossible, however. The market in electricity is almost hopelessly complicated to the layman. Even experts in certain places, such as New England, profess that they cannot understand the market rules for the product’s trade in, say, California. If knowledge is power, then this type of power is the one scarce attribute of electricity. The shortness of the public’s attention span for headlines dealing with energy does not help matters. A rate hike here, a pipeline there, and Earth Day once a year—beyond this, the public is ill-equipped to judge a sector that is more opaque than even finance or telecommunications. So a primer on the basics of this business, as well as a diagnosis of its systemic flaws, should precede any policy proposals to reform the government’s nearly all-encompassing relationship with the trade in electric power. 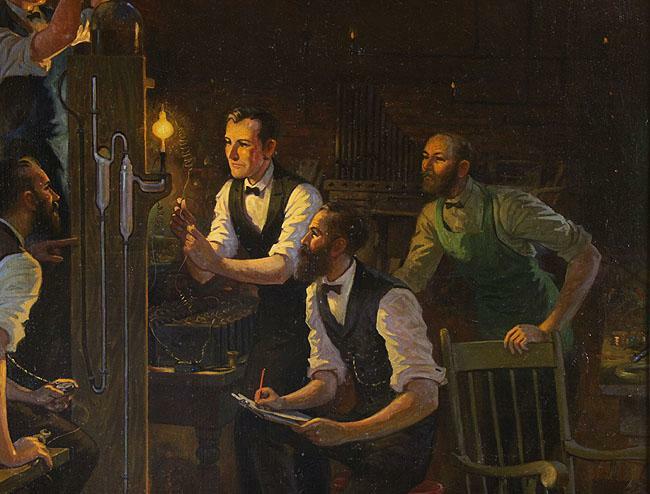 While the story of Thomas Edison is usually depicted as a triumph of innovation, it is even more importantly a story of how a transformative invention became quickly attached to the apparatus of the state. Innovation was its kernel, but it was at full blossom only by recourse to state power. Histories such as Jill Jonnes’s Empires of Light (Random House, 2003) and novels such as Graham Moore’s The Last Days of Night (Random House, 2016) tell the same story: Edison and Westinghouse jockeyed in a technological battle over the proper electrical current to supply consumers (direct versus alternating) and over the design of appliances that would use each current. Although AC would eventually become the dominant delivery method of electricity, Edison won the early victories and today wears the laurels of the “Father of Electrification.” He did this by waging a battle of public opinion designed to impel political action, rather than by selling a superior product. For example, he dispatched lieutenants to perform grim demonstrations of the supposed danger of the rival technology (a golden retriever and other animals were electrocuted as part of a traveling public spectacle) and then, building on the perception of a technology spinning out of control, convinced policymakers to endorse the “safer” alternative: his own. Elsewhere, Edison turned litigiousness into an art form, driving competing technologies out of business on frivolous patent claims. From the beginning, the business wanted to be regulated. Samuel Insull, Edison’s one-time employee, laid the groundwork for electrical monopoly. When Insull arrived in Chicago from Edison’s New York, there were “almost 500 self-contained systems” powering the growing city’s hundreds of thousands of lights, according to Jeremiah Lambert’s The Power Brokers (MIT Press, 2015). It was a bonanza, and to Insull it had the look of ruinous competition: an industry with high fixed costs failing to exploit its natural economies of scale. But it was impossible, as a legal matter, to prevent new or smaller firms from skimming the cream of the customer base, making deals with manufacturing plants or large commercial properties like hotels while leaving residential customers without service. Insull first bought out rivals, but this was not enough. He and his contemporaries eventually cut a deal that would later be replicated across every single state in the union: exclusive franchise for the new monopoly utility, in return for the regulation of rates and the provision of service by the government. It is an odd story, but one that sounds paradoxical only given the current dichotomous portrayal of regulation and business interests. With few exceptions, the way these companies earn revenue has not changed for a century. The basic formula is the same everywhere, and it seals the relationship between regulation and corporate revenue. The regulator reviews the reasonableness of the utility’s operating expenses, usually allowing virtually all of them to flow into consumer rates. The regulator ascertains a total value of capital investment, or rate base, usually based on its original cost less depreciation, and fixes a lifespan for those assets, allowing a return of the capital investment over that time. Finally, and perhaps most importantly, the regulator ordains a percentage return on investment; this is usually about 7 to 9 percent in the current environment, applied to the undepreciated amount of capital the utility’s debt and equity investors have contributed. The sum of these costs is the “revenue requirement,” which can be thought of as a pie that is subsequently apportioned into individual slices—the rates a customer pays for kilowatt-hours of electricity or dekatherms of natural gas, which should earn the company the “revenue requirement” based on projected customer consumption. These rates then remain fixed until the regulator changes the rates. The expenses and sales volumes incorporated into rate regulation do not reconcile to the company’s actual expenses and sales volumes. Indeed, it is this lack of reconciliation that is the source of essentially the sole businesslike incentive present in the revenue model. It provides a narrow band for the utility to earn potentially more (or less) than its regulatory “revenue requirement” by reducing costs or providing more of its service. Boring as this detail may seem, it is the key to understanding the electrical market. This so-called cost-of-service regulation suggests to the utility that it should spend as much as possible, even when less might do. The barometer for whether an investment is wise for a utility is not capital productivity, but whether expenditures will be disallowed by the regulator. This seldom occurs. Indeed, the legal presumption that governs the arcane, trial-like proceedings of utility commissions is that all utility spending is prudent. A utility earns a return even on the cost of decorating the C-suite. Investment funds understand this dynamic perfectly. Their analysis often simply celebrates more and more capital investment (“ratebase” or “capex” in industry lingo), with little attention to the underlying value it delivers to customers. One recent investor note by UBS on the New Jersey utility PSEG was titled “More Ratebase Please.” PSEG advertised its ever-increasing “spend” to its investors, optimistically presenting a case that it would add more to “ratebase” than even its prior projection. This is the thinking of an industry that has come to expect that every dollar will attract the standard regulated return. Utilities often boast that they are “100% regulated,” as one utility from Montana recently told its investors. Regulation, in their eyes as in Insull’s, is a profitable enterprise. In recent decades, utilities have tended to ask regulators for pre-approval of investments or to update rates monthly or yearly to true-up to actual expenses, two modifications to the traditional revenue model that allow the monopoly to escape ever more of the business risk that any other enterprise would face in the course of its ordinary dealings. Consumers are increasingly on the hook if a power plant a company builds proves to be uneconomical or if a utility’s procurement practices are sloppy. Meanwhile, regulators, like much of officialdom, cherish the thought of being in the mix. They like approving shiny new things, even if it means stepping into the managerial prerogative of business—in this case a business willing to surrender its prerogative, so long as it produces income from a captive set of consumers. This mode of utility regulation perversely causes a utility to be hostile to assets that are still productive, yet fully depreciated per the company’s books. This hostility to depreciated assets emerges because, when a utility’s capital investment is returned to it through regulated rates, it earns nothing on an asset’s continued productivity. This attitude is opposite that of most businesses, which lose money on new assets in the first year of ownership only to grow their earnings in the outer years as the asset’s financing is repaid. A silver lining, one might assume, is that this impulse toward new capital investment would incentivize innovation. Yet it only sometimes does. Innovative products often make the old ways of doing things cheaper, reducing a utility’s capital spending and thus its regulated earnings. Innovation and the utility’s profit motive are frequently misaligned. Consider cloud computing, for example, which is utilized typically through software-as-a-service (SaaS) offerings. In the formula for ratemaking expressed above, this type of expense is recovered in utility rates—but not at a mark-up. An in-house software solution, meanwhile, is capitalized; a utility will earn a regulated return on this investment. Consumers almost certainly stand to benefit from SaaS. It relies on expertise which the utilities cannot hope to in-source; it is updated more frequently to allow it to synchronize better with the utility’s other technology such as meters and the devices which read them; and, for both of these reasons, cloud computing is usually more secure. But many utilities still tend to favor the in-house solution because their bottom line does not stand to benefit from the very attribute—its subscription basis that allows it to be nimble—which makes SaaS a clear winner. Innovation also can be a harbinger of customer bypass of the monopoly network, something a utility has reason to fear on an existential level beyond the coming year’s earnings projection. Here, the telecommunications sector, where AT&T remained a monopoly through the mid-1990s, is instructive. AT&T was regulated similarly to how an electric utility is today. Only after the demise of Ma Bell’s regulatory superstructure did the widespread roll-outs of mobile telephony and the convergence of data and telecommunications occur, which we now take for granted. Deregulation did not necessarily cause this innovation, but it certainly allowed it to become widespread. For all of its obvious flaws, the cost-of-service regulatory model is not an abject failure. When the main object of energy policy is an affordable, abundant, and reliable supply, the system muddles through well enough. However, this revenue model no doubt causes significant measures of deadweight in the system. Furthermore, it deprives customers of choice, and causes them to bear an undue amount of risk that would more properly be allocated to private business. Nevertheless, the monopoly did deliver on its promise of economies of scale. The price of a delivered kilowatt-hour of electricity has steadily fallen decade after decade since the time of Edison and Insull, as consumer demand for energy continued to increase and the costs of the integrated network were spread over these growing sales volumes. The problem is that the legal standards that were taken as approximate expressions of least-cost, reliable, abundant supply are themselves not descriptive of these attributes. On the contrary, most statutes that govern utility ratemaking at the federal and state level offer a vague command: “All rates shall be just and reasonable and any rate which is unjust or unreasonable is hereby declared unlawful.” Regulator, the legislature is directing, you go figure out what that means! In other places, utility regulators must judge whether projects are “in the public interest.” Obviously, everything the government does should be measured by this standard—but as the sole bounds of administrative decision-making, the standard is so capacious as to permit consideration of virtually anything that appears before the regulators or stakeholders. As we shall see, the combination of the incentive for capital spending and the growing universe of things considered to be “in the public interest” takes the perverse incentives of regulation and makes them even more noxious. But before we explore this, it is worth considering the handful of things policymakers have done to attempt to make the electric power industry more like other businesses, where investors risk their capital and where customers have a choice in their supplier, before we explore how and why those initiatives have come up short and are lapsing back into monopoly. Everyone gets sick of monopolies at some point. For the electric utility industry the reckoning seemed to arrive during the 1970s and ’80s. Explosive growth in consumer demand was slackening. Industrial growth was plateauing. Residential customers were finally achieving a steady-state of household appliances—and those appliances were becoming more energy-efficient. The utilities missed the mark, however, fooled by rosy projections of customer demand that led them to construct dozens of power plants and grid upgrades that were no longer needed. The network economies of scale suddenly were pitted against customers, as the monopoly expected that these imprudent expenditures would nonetheless be paid for by consumers. Regulators allowed some of them through but, for almost the first time, disallowed several large, clearly useless projects from being passed along to consumers. There was a better way. Insull had convinced policymakers to franchise to him the entire vertical structure of the electric power industry. The traditional electric utility encompassed not just the substations, poles, wires, and transformers required to deliver power. It also owned the sources of power generation and held as a matter of law the right to exclusively sell this bundled product—the generation, transmission, and delivery of electric power—to a set of customers bounded by a discrete geographic area. Even when generators were owned by an entity other than the incumbent utility, the latter was a monopsony, exerting buyer-side control over them. It made sense, perhaps, not to duplicate the grid; early photographs of the electrification of urban areas show a bonanza of wires crisscrossing one another, dangerously and wastefully. However, for those that might plug into the grid—the generators upstream and the customers downstream—why was it necessary to rely on a single monopoly? The marketplace for electricity has evolved in the United States, but has done so in a haphazard way. In about half the country, utilities are still vertically integrated monopolies; they own the grid and everything else it intermediates. But in the other half of the country, the utilities are structured as poles-and-wires firms across whose physical architecture unfolds a complicated auction process where power plants compete with one another upstream and customers downstream have a choice of retail supplier. In these restructured marketplaces that stretch from the Rust Belt to the Mid-Atlantic to New England, traditional utilities retain ownership of the grid but have turned over the keys of daily operational control to an Independent System Operator (ISO). Power plants submit bids to the ISO, which acts as the traffic controller of the grid and the auctioneer for a market in electricity, accepting enough bids to meet projected consumer demand, and thereupon issuing instructions to generators to start up, shut down, ramp up, or ramp down. The highest bid sets the market clearing price, which all generators are paid, except that higher-cost bids can leapfrog lower-cost ones when the transmission grid in an area of high consumer demand is unable to receive imports from elsewhere, in which case a higher price prevails in that congested area. Typically, a day-ahead market exists to set up a schedule of which power plants are expected to operate. But then in recognition of the fact that certain power plants will be unavailable and that demand will not match exactly the projection, another auction is run closer to real-time to further optimize the match of supply to demand. Meanwhile, on the downstream side, customer-facing retailers have the responsibility of sieving this auction process into something that does not completely bewilder customers. They passively take the auction results, or rely on financial traders to hedge for them, and vend more easy-to-understand products (a service with a nighttime and a daytime price, for instance) to their customers. Through government regulation, meanwhile, the monopoly utilities are still paid an amount intended to be equal to the cost of keeping up their poles and wires, which form the physical architecture that make this auction possible. This, at least, is the theory spelled out in the seminal literature, most notably MIT professors Paul L. Joskow and Richard Schmalensee’s Markets for Power (MIT Press, 1983). Introducing competition to the electricity marketplace was the first genuinely novel idea to occur in the industry in a very long time, and while there are only two decades of data available in the experiment with competition, it seems to have worked to consumers’ advantage. Yet markets for electricity—or “markets,” as it may be necessary to qualify them in their practical exegesis—are not easy things. One does not walk into the substation and turn a dial for a certain measure of kilowatt-hours, as a consumer would walk into a grocery store and procure an orange. Electricity is usually instantly and unconsciously demanded by customers, with no public toleration for a shortfall in electric supply. Yet electricity cannot readily be conserved. This means there must be enough generators to supply power—some of them almost never operating—to meet the collective peak demand of all customers. It also means that even outside of peak times, but when there are sudden changes in demand (when customers are arriving home from work) or when there are sudden changes in supply (when the sun sets on the photovoltaic installations dotting the State of California), the total fleet of power plants and the grid itself must be nimble enough to ramp up and down to maintain the system’s balance. Electricity’s physical attributes mean that if any of this goes wrong, blackouts and severe physical damage to the grid are the consequence. These demands quickly run up against how competitive electric markets are designed to work. Power plants cost a lot of money, and usually the market-clearing price of an ISO’s auction reflects the operating costs—primarily fuel—of the highest-cost bidder. That is because rational bidders usually submit bids of slightly more than their operating costs, without incorporating any of the costs of having constructed and financed the power plant to begin with, since it is economical to be paid for any given hour of operation at any amount higher than one’s operating costs. Meanwhile, the singular market-clearing price protects lower-cost bidders by awarding them the same amount as the highest-cost bid necessary to supply customers energy at a particular trading interval. In order to repay power plants’ large up-front costs, however, there must be scarcity at certain intervals. 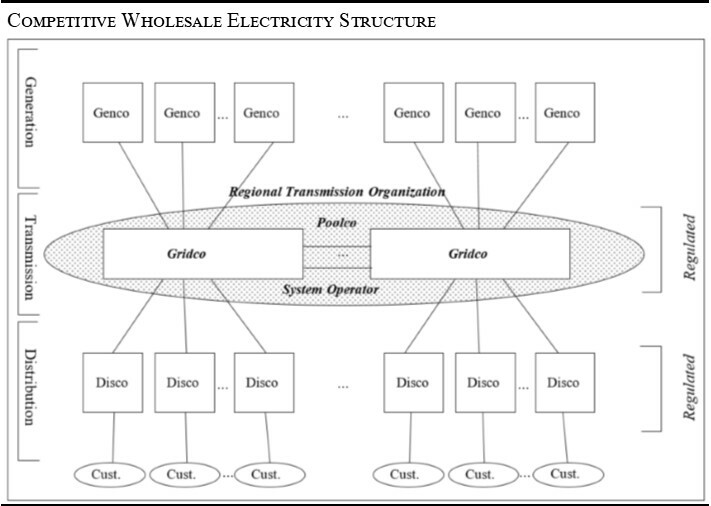 Supply must not be sufficient or must barely be sufficient to meet demand at certain times, whether because of unusually high demand, outages of a competitor’s generators, outages on the transmission network that would deliver generators’ product to market, or sometimes (as in the Enron scandal) through fraudulent conduct that makes it appear that there is less supply or more demand than in fact there is. Only in these situations do prices truly spike, and only then do power plants’ owners obtain the substantial revenues sufficient to compensate them for having built their plants in the first place. Volatile, occasionally high prices are a feature, and not a flaw, of the auction. Economists, working on the blackboard, will argue that the cure for high prices is high prices because it will induce developers to build power plants. They will also contend the opposite, that persistently low prices will eventually cause higher prices, because they will force generators into insolvency and raise the price for the remaining players. The equilibrium, the theory tells us, should nonetheless cost less over time than simply allowing a monopoly, a legislature, and a utility commission to collude with one another on power supply by central planning. But tell that to policymakers who see scarcity pricing as either an intolerable burden on customers, an indicator of a dangerously inadequate supply, or as devastating to workers who stake their livelihoods on the existence of a massive power plant that cannot efficiently compete against other plants. In any case, the power plants that are producing the good which is traded in the market have lifespans equal to a human generation or longer and cost hundreds of millions or (in the case of nuclear stations) billions of dollars, the lumpiness of the investment appears mismatched to the vicissitudes of the market. Still, the competitive electric market as a theoretical concept has been actualized in reality. Yet nowhere are these markets “deregulated,” an attribute which often attends the introduction of competition to formerly price-regulated industries. Paradoxically, competitive markets appear to attract more regulation. Consider the length of “tariffs,” the written documents that control the prices or practices of a monopoly utility or a market operator like an ISO. The tariffs that govern the competitive ISOs are approved by the Federal Energy Regulatory Commission (FERC), which has responsibility for wholesale energy trading. The tariffs governing “market” relations are enormously complex, spanning several times the length of the tariffs that govern the vertically integrated monopolies, whose charges are regulated by state utility commissions. Monopolistic command-and-control regulation is rather simple by contrast: a utility spends money on a power plant, and the regulator fixes a price intended to recover those costs. The regulator of competitive markets, on the other hand, first has to describe what product is to be traded in the auction. These include, depending on which market one is operating in, day-ahead energy, real-time energy, capacity, flexible ramping, regulation and frequency response, congestion and transmission rights. Then the regulator must define the auction: when, how, and by whom is the product traded. The very need to define the market opens up new avenues for shaping it. In this style of regulation, the market operator—and not customers themselves—is responsible for projecting demand for electric capacity several years out. The market operator pads this projection with a “reserve margin,” a percentage adjustment for surplus capacity ordained by a regulator, just to take special care that there are enough generators on the system. The market operator then uses this forecast to establish the demand curve, which forms the basis of the auction that suppliers are bidding into. Such an auction has almost nothing in common with the marketplace in which consumers consider whether to buy a good. It is established utterly by technocratic guesses—perhaps very well informed ones—but not by consumers’ actual behavior. This means we are back to square one with regulation, because this element of the power market is quintessentially command-and-control, or possibly something even worse. In practice, such tariff requirements for projecting demand are usually written through a process driven largely by “stakeholders,” the euphemism used to describe those who have a private-profit motivation in the outcomes of these markets. A stakeholder who owns power plants will argue for a higher reserve margin, because as the market’s artificial demand for capacity is set at a higher threshold, the opportunity to profit increases. Usually, these moneyed “stakeholders” get their way. (The stakeholders that are responsible for building transmission lines have similar incentives.) ISOs—the market’s operators—are usually chartered as not-for-profit corporations, although their boards are mostly selected by industry. An ISO thus has attributes both of a government regulator and of an industrial participant of that market. Unsurprisingly, ISO projections of consumer demand have often turned out, in retrospect, to be overestimates. ISO markets are also subject to regulation by officeholders working under the same capacious statutory guidelines of yesteryear—“just and reasonable” and “in the public interest”—which allow (or require) them to import ideological predilections into the mundane tasks of wholesale electric market design. For example, Jon Wellinghoff, the former chairman of the FERC and a regulator of a green bent, once declared himself a “soldier” fighting in “an epic battle” for something called “demand response”: the ability of a customer to be more participatory, rather than a passive thing represented in the market through an administratively established, inflexible, often inflated demand curve. His was a noble cause. But, ironically, the reform he implemented doubled down on the problem. The FERC retained the central administrative forecast of customer demand, and made it more complicated, divvying up the projection to particular customers. According to the FERC, if a customer, usually a large industrial or commercial user, ends up using less at a particular time, the customer is paid for the difference between its forecast and actual demand at the same price that a power plant itself would have been paid. In the words of Bill Hogan, a Harvard professor who has spent a career opining on the design of these markets, it is a policy of “I decided not to consume electricity. Please send me a check.” Not surprisingly, many businesses now specialize in demand response aggregation—grouping together customers to obtain revenues by acting as a kind of hypothetical power plant under this regulation. If a firm derives revenue from the decisions of the regulator, then it follows that the firm will devote many resources to the regulatory process in order to maximize that revenue. This rent-seeking behavior has always been a problem for a sector dominated by regulated monopolies, but many of the new regulations, such as Chairman Wellinghoff’s, serve to expand the community of rent-seekers. At best, they merely put different communities of rent-seekers in something resembling competition with one another. That competition pivots not on attracting customers, but on persuading a regulator or an ISO of a market design that will maximize that stakeholder’s profit. Federal tax credits for renewables. Since 1993, wind, solar, and certain other renewable technologies have been eligible for a federal production tax credit, or PTC. For systems that began construction last year, the PTC amounts to $23 for each megawatt-hour produced within the first decade of the plant’s existence. Congress finally passed legislation phasing out the tax subsidy, after what can only be regarded as its having wildly succeeded in promoting the installation of these technologies, which have grown exponentially in the last decade. Today, there are more megawatts of wind generators than hydroelectric generators in the United States. State renewable energy requirements. In addition, more than half the states have enacted renewable energy standards. These standards are a crazy quilt of requirements, calling all different types of technologies “renewable.” For example, in Montana, were one to burn scrapped, creosote-laced railroad ties in a boiler for the production of electricity, this would be classified as “renewable.” But all the standards similarly have the requirement that local utilities purchase a particular amount of “renewables,” usually on the basis of a percentage of a utility’s total sales. In California, for instance, the state requirement is 33 percent by 2020, although the president of the state’s senate has proposed increasing the requirement to 100 percent by 2050, and hastening an existing requirement for 50 percent to 2025, down from 2030. To comply with these laws, utilities and other suppliers of power must acquire a sufficient number of RECs, or renewable energy credits, which are government-created commodities equal to one megawatt-hour’s production of a qualified renewable. It all makes for a great bumper sticker—25% by ’25!—but these laws have the practical, and rather anti-conservationist, effect of introducing additional power plants into markets where they are not necessary to supply customers. These twin policies—the federal tax credit and the state renewable standards—have led to a glut of power sluicing around the sun-soaked southwest and the windy Great Plains, and have had significant unintended consequences for the market in electric power. Wind and solar facilities, unlike coal or gas, have no variable or fuel cost. So one would think that they would bid, or be willing to take a market price, of zero or slightly more. That supposition is wrong—and not because they need a number larger than zero to make their projects pencil out. Since the IRS awards the tax credit on the basis of production, and since RECs likewise are created only when a wind farm or solar plant is producing energy, these renewable power plants have a negative marginal cost equal to the inverse of the value of the PTC plus whatever a REC is worth to a utility under state law. In other words, renewable power plants are willing to pay consumers to take their energy output, up to $23 per megawatt-hour, lest they lose out on the PTC and the piece of paper that is the REC. This is not an insignificant amount of money. Audits from one large utility, the federally owned Bonneville Power Administration, suggest that some renewable plants earn twice the amount of money from these twin government policies as they do from the actual sale of electricity. As the amount of renewable energy grows, there are occasions when non-dispatchable energy, including renewables and other power plants that cannot easily be ramped down, such as nuclear reactors, outstrips actual customer demand. In these situations, electricity prices go negative. Thereupon an amusing game of arbitrage begins. In California, a REC is worth more—because of the state’s renewable energy policy, which is often called “ambitious”—than a REC in, say, Arizona. So when there is a surplus of solar energy in California, producers look to dump the excess on someone else to ensure they still produce a REC. Arizona may not need the power either, but its solar producers won’t accept as low of a negative price as the Californians. Thus, in the past year of trading, California solar has exported to Arizona, in circumstances where solar production there must be shut off to make room for it. One cannot blame the “market” for this—it is merely rationalizing irrational public policy. But this is a market warped by subsidies before its trading day even begins. The market can be made more nimble by knitting together utilities to receive one another’s surplus, or, when the sun sets, to make use of natural gas–fired power plants that ramp up quickly to meet customer demand. Some devices attached to the grid are designed to keep the system in balance by acting as a source of demand to absorb the surplus. One of them, called a breaking resistor, resembles a giant toaster and can take more than one thousand megawatts of supply, convert it to heat, and dissipate it. (It can only do this for three seconds before literally melting.) But if the market cannot find a way to dispose of a steady flow of surplus energy, the market operator has to curtail its energy output. This spring, as snowpack in the mountains melts away and hydro and solar production outstrip customer demand for power, the California ISO has announced that it expects to curtail 8,000 megawatts of solar—enough to power nearly five million homes. The economically rational response, perhaps, would be for the California governor to decree a Festival of Natural Overabundance and order public buildings to crank up their AC—but, of course, the state simultaneously continues to subsidize energy efficiency programming through other government policies. Disappearing nuclear power. Renewables and cheap natural gas have suppressed market prices around the clock, in addition to creating occasional conditions of genuine oversupply. Those low prices have made uneconomic (again, within the context of this “market”) the most prolific source of zero-emissions power: nuclear. Since 2012, fourteen reactors have closed or are scheduled to close in the United States. Carbon emissions—which, one imagines, renewable subsidies are supposed to abate—will almost certainly rise as a result. But, worry not, state legislators and regulators have thought of a way to “save” the carbon-free nuclear capacity. Starting in 2015, New York and Illinois utilities that own nuclear power plants began a lobbying campaign that could probably best be summarized by the time-worn adage—if you can’t beat them, join them. The idea is to reclassify renewable energy standards to encompass all sources of “clean energy” and create yet another government commodity, the Zero Emissions Credit. The Illinois legislature and the New York Public Service Commission both approved such a program last year. In New York, the ZEC’s price is determined by the regulator, and is equal to the difference between the power plant’s operating costs and the revenues it is projected to earn from the market. It is, in other words, a return to the command-and-control, cost-of-service regulation described above, masquerading as innovative, progressive public policy. It may sound fair to give nuclear the same credits that renewables obtain, but not even this is happening—in the same breath in which the virtues of emissions-free nuclear energy were being extolled, the program’s authorizing document notably excluded the Indian Point nuclear plant, on no cogent basis other than that Governor Cuomo decided that it should be so. Meanwhile, the economists who designed the competitive markets are in despair, and in order to maintain the integrity of the design—that market revenues should be sufficient to allow an unsubsidized generator an opportunity to pay for its capital costs over time—the market operators too have been introducing new features of the market. ISO-New England and PJM, the market operator for the Mid-Atlantic states, have introduced markets for capacity. Recognizing that weather-dependent renewables produce a lot of energy, but are not in service at all times, capacity auctions are intended to provide revenue to the power plants that are not earning sufficient revenue from the energy market to support them, but which a regulator or a market operator thinks are necessary to have hanging around in case they are needed—this guesswork is the outcome of the market operator’s customer demand projections discussed in the sections above. But if subsidized energy sources, such as ZEC-infused nuclear plants, are allowed to compete in these capacity auctions, then even a market in capacity will become distorted. So by and by, over the last several years, a solution for this new dilemma has been conceived: the Minimum Offer Price Rule. Just as the market operator establishes an artificial demand projection, the MOPR is a supply-side guess on what the cost of new entry for the least-cost, unsubsidized power plant would be. The pretense is that subsidies do exist, but should not affect the market price—although the remedy, in practice, considers only some subsidies (state procurement mandates, but not federal tax subsidies). The MOPR establishes an administrative price floor to which everyone’s bids are subject, so that subsidized power generators cannot underbid and warp the market. It does not quite apply to everyone. A bidder can prove to the market operator—because they have gotten a great deal on this equipment or that labor contract or have control of a cheap brownfield site—that they should be exempted from the MOPR based on the genuinely lower cost of their project, and not because of governmental subsidies. This policy is, like New York and Illinois’s ZEC program, cost-of-service regulation all over again. It merely swaps bureaucrats in the form of a state utility commission, fixing prices based on costs, for a technocrat market operator effectively doing the same. The MOPR represents the unhappy concession, on the part of the economists and politicians who design these markets, that the price of electricity traded on them is neither reflective of the commodity’s actual cost nor of the commodity’s actual value. Or at least it is not, so the idea goes, without constant tinkering, coupled with provisions which put the market operator in the driver’s seat not only on the question of who is allowed to bid but at what price they are allowed to bid. The End of Electric Markets? Nowhere, then, is there truly a free market in electricity. Markets have competitive features, but they are so intermediated by command-and-control decision-making with respect to both supply and demand that they have more in common with old cost-of-service regulation than with a “willing-buyer, willing-seller” market of the conventional imagining. Yet there is evidence that these sort-of-competitive markets still better serve customers than purely command-and-control regulation. Customers in the sort-of-competitive markets are being served more cheaply than are those in similarly situated markets that did not introduce competition. More and more customers seem to be shopping around for suppliers, where choices exist. Importantly, when innovation in the sector has occurred, those innovations appear to take hold more quickly. The revolution in the way natural gas is obtained from interstitial deposits in shale, for instance, has dramatically lowered natural gas cost. In the sort-of-competitive markets, these savings more rapidly show up on customers’ electric bills, because developers have been more nimble on the uptake of building natural gas–fired power plants. Furthermore, generators that exist only because of the protections offered to them by monopoly regulation more frequently exit the market. In general, power plants’ capacity factors—the percentage of time when the plant is actually churning out energy—are more robust in these markets, suggesting that however warped the price signal of these markets may be, it is at least sufficient to clear out deadweight or to prevent uneconomic entry in the market at the expense of customers. Even in places where the vertically integrated utility model is still dominant, ISOs have played an important role in dispatching those utilities’ power plants across a multi-utility footprint, allowing these monopolies to rely on spare capacity of another utility, and avoiding the needless construction of an additional power plant that will seldom operate. So it is somewhat sad that the sort-of-competitive markets appear to be falling out of favor—not because they are not genuinely competitive, as this essay has criticized, but because they are just competitive enough that they deny state policymakers the perquisites of selecting favored resources. Over the last several years, those favoring a policy of renewables and decarbonization have largely turned away from more direct approaches to policymaking, such as the emissions cap-and-trade legislation considered and rejected by Congress in 2009, and have appreciated anew the potency of both environmental regulation and utility regulation as the unheralded locus of administrative power that they are. With this turn has come the recrudescence of the vertically integrated monopoly as a vehicle for policy. Colorado, Nevada, Minnesota, Massachusetts, Maryland, California, Washington, and Oregon have all seen attempts either by the legislature or a regulator to appropriate utilities’ balance sheets for industrial policy. In most of the states, the gambit is similar: the state directs that a utility phase out certain power plants, usually coal, and licenses them to build new ones, usually renewables and sometimes powered by natural gas. These power plants then go into the regulated monopoly’s rate base, on which the firm earns a regulated return. It is unlikely that many of the investments made under these state laws would be supported by a “free market”—by energy consumers choosing to pay for it, as they would for organic apples versus Red Delicious at the grocery store. In Montana, a utility offering that allows customers to voluntarily purchase an allotment of renewable energy equal to 100 percent of their needs has attracted only one-tenth of one percent of all customers. Even today, the electric power industry’s investments are largely supported by the government’s promise that there is a captive set of customers in place to pay for them. These laws are proliferating, and they are not limited to renewables but whatever a legislature might prefer. A Minnesota law recently ordained the construction of a natural gas plant—but only if it were in a certain county, on property already owned by the utility—a new type of earmark, as it were. The law is an ostentatious example of government openly ordaining a winner, yet it was cheered along by credulous Republican legislators, who imagined that the regulator had been holding back a private business from investing capital as it saw fit. But, of course, the “public utility” is hardly like a private business, and the law explicitly provides that the regulator “must approve recovery of costs associated with the construction and operation of [such] a plant.” It is hard to see in the guaranteed recovery of capital spending any of the usual risk-reward paradigm that Republicans tacitly celebrate when, as is their wont, they declare that government should be run like a business. For in this situation, government is running the business, full stop. Legislation like this heralds a new phase of governmental control over the power sector. It is not only the parochialism of states driving this sad trend. The Environmental Protection Agency’s attempted regulation of carbon-dioxide emissions had as its predicate the idea that a utility should build lower-emissions power plants, such as wind farms or gas plants or biomass facilities, to reduce the dispatch or to cause the retirement of the company’s coal plants. The Obama EPA must have read the book on the perverse incentives of utility regulation, because the agency’s Clean Power Plan hit all the right notes and was received glowingly in many quarters of the regulated utility industry. After all, what better way to convince utility commissions of the necessity of pumping capital into greening the grid, and of course earning the regulated return on that spending, than to say—how sad—that the EPA was forcing the utilities to do so? The attitude of most regulated utilities to onerous EPA regulations is starkly different from, say, Exxon Mobil’s; for the former, each dollar of compliance earns a return, while for the latter, it often comes out of the bottom line. When Donald Trump was elected in November, one of the few sectors not to register gains on Wall Street was the regulated utility sector, even while shares of independent power producers not subject to cost-of-service regulation ticked up. This is at least in part because the regulated utility sector’s value was linked to expectations that the Clean Power Plan would remain official federal policy. With that regulation now on the ropes, an avenue to increased rate base, and thus increased regulated profits, appears shaky for the monopoly utility sector. Unless, of course, the expansion of their balance sheets becomes part of the next big government policy—say, a large infrastructure package. Putting utilities on a budget. The regulation of utilities should be an enterprise aiming at the goal of economic efficiency. The chief purpose of the government’s involvement in electricity should be to motivate the industry, wherever possible, to behave as other businesses do. If it serves those ends at all, “cost-of-service” regulation does so quite poorly. Where the regulation of prices is inevitable, both federal and state regulators should put utilities on a budget, tied to something other than regulators’ own discretion, such as GDP growth or an index of inflation net of productivity. Many regulators have stubbornly declined to treat utility spending with even an iota of skepticism. This should end. The utility industry is a mature one. It should not need to grow more rapidly than other sectors of our economy. Declaring to a price-regulated industry that it will have to live within its current rates, increasing only slightly every year for a decade, probably would do more to stimulate innovations in serving customers than any centrally planned regime. Such reforms would also prevent utilities from being so easily co-opted into regulatory models that require them to spend large sums of capital that are not tied to increased productivity, but are tied instead to social and environmental policy. Even where such policies are necessary, it is important not to make a cheerleader for regulation out of the very industry to be subject to those requirements. Making utilities nimble. To be truly innovative, utilities also need to shoulder more of the responsibility for making the types of decisions other businesses do. Currently, utility commissions closely regulate not only the prices utilities charge, but also engage in an almost constant game of “Mother, may I?” with regulated industry on everything from quality of service standards to pre-approvals of tree-trimming plans. A better way of doing things would involve unraveling part of the deal Insull cut a century ago. Stop the pernicious trend of a utility requesting permission for virtually everything it does and, at the same time, withdraw some of the protections of their exclusive franchise. Does a customer or a neighborhood want to withdraw from the utility? Perhaps it is time to let them exit, but also to give the utility the right to cut a deal with those defectors and offer something better (whether cheaper or of greater value) than the price-regulated service ordained by utility commissions. To perform efficiently, utilities need the prospect that they will earn some return potentially higher than (or less than) the standard return offered on every dollar of capital spending. Such a change requires careful accounting to prevent cross-subsidization if the utility is to remain an incumbent, regulated monopoly in some places but a firm putting its capital at risk in others. Some who have experimented with industry restructuring favor a complete prohibition on the monopoly doing any business in potentially competitive niches of the industry. It would also be possible, even while retaining exclusive franchise and revenue regulation, to make utility ratemaking less confining and to allow the utility to change its rates and product offerings more organically in response to customer demand, while still remaining under an overall collar on revenue. Competitive project selection. Competition between monopolies is also important. There is no easy way to fully de-monopolize the transmission lines that stitch together the grid. But there are certainly ways to open up the construction and ownership of those lines to bids from multiple utilities, not just the local incumbent. To the FERC’s credit, the regulatory agency has already tried to introduce this type of competition through Order 1000, which the agency adopted in 2011. This has yet to bear fruit, and needs to be refocused. The FERC should reduce the authorized rate of return for incumbents who operate in areas not subject to competitive solicitations, and boost the returns for those projects which were competitively selected—so long as those projects agree to construct the project under a cost cap. (A cost cap limits customer exposure to the significant risk that such projects come in over-budget, with those costs then shifted to customers under the cost-of-service revenue model.) Interconnecting different parts of the United States also makes it more difficult for local incumbents to monopolize the economy and politics of a place, because while they might be big fish, their small pond has grown larger. Supporting competitive auctions. The best way to combat the perverse incentives of the utility industry, however, is by keeping up efforts to substitute monopolies with competitive firms. As this essay has argued, this is harder than it seems, and impossible to fully accomplish. Yet supporting competitive auctions—even if they are just “sort of” competitive—is an important tool to rationalize the way power plants are built and operated. These auctions are the only thing standing in the way of outright government selection of power resources, and the cronyism that that entails. Yet as described above, there is a temptation to make these auctions more complicated than they need to be. Their value proposition collapses if their design includes unnecessary features that have the practical effect of putting a regulator’s finger back on the dial, in place of firms making business decisions. Ultimately, it should be an end goal to allow peer-to-peer transactions to unfold in this industry, like they occur in every other. For the reasons described earlier, the technology of electric power supply and the design of the market make this difficult—for the moment. A day may come when something more genuinely competitive may be possible, with the advent of more economical storage technology, for example. Regulators should always be on the watch for this, and should be willing to put themselves out of a job if and when it occurs. Energy in the executive. These reforms, for the federal jurisdiction and in most states, would require no statutory change. They need only energy in the executive, leavened by humility. The FERC, under previous leadership, reshuffled its economists to a lowly rank in the bureaucracy while promoting a cadre consisting mainly of lawyers who, as is their métier, saw the work of economic regulation as mostly about transacting deals between divergent stakeholder interests. The “stakeholderization” of the regulatory process usually rewards rent-seeking at the expense of the party most infrequently represented: the consumer. (And the consumer advocates who do appear in these proceedings often do double-duty as environmental advocates, hopelessly conflicting themselves.) A regulator should not be mistaken: the parties appearing before him are not the public, and the interests of stakeholders together do not constitute the public interest. A greater reliance on those positioned to be self-skeptical about the perverse incentives that regulation all too often engenders is essential. Of all the agencies in the federal government, the FERC (as well as the Federal Communications Commission, which like the FERC has vacillated between being a force for lessening regulation and increasing it) actually employs a sizable number of people who fit this bill. They should be empowered. Achieving environmental goals. Ultimately, auctions for electric power cannot easily co-exist either with tax policy that prefers certain resources and distorts the market’s prices, or with the many state actions that have legislators and regulators explicitly selecting resources. They can co-exist with other technology-neutral policies designed to achieve environmental goals. If there is going to be a greenhouse gas (GHG) emissions policy in the United States—and it is hardly clear that there ever will be—it should be one that does not try to get at this goal through end-runs like government resource selection. (Germany’s renewables and anti-nuclear policy has, ironically, increased the country’s carbon emissions.) The only plausible way to regulate GHG emissions is to do it straightforwardly, by taxing emissions directly, or by capping emissions and letting allowances for them be traded between emitters. If sufficient political support for such policies does not exist, the answer to this problem is simply to do nothing—or promote the development of as-yet-nonexistent tools to combat emissions through research and development of those technologies that show promise, but which face a barrier to commercialization. (No utility is clamoring to be the guinea pig for a first-of-its-kind power generation technology.) At the present time, there is no good option to constrain emissions if government is unwilling to tackle them head-on. Yet those “third-best options”—state policies that pick winners and losers in the power-generation business—will continue to proliferate unless the Trump administration takes decisive action to stop them. States themselves should be rejecting initiatives, but if they are not willing to, then it is up to the administration to consider whether to preempt them. The Federal Power Act already permits the government to make an argument for doing so, and it would probably be successful. Although it would anger states and sound contrary to Republican rhetoric on federalism, these marketplaces are quintessentially interstate in nature for the continental United States—all except that of Texas, which in a very Texan way has its own grid. One state’s selection of favorites inevitably affects other states. Facilitating energy infrastructure. There is, finally, one interventionist role that government can play in a way that could benefit consumers and the national interest: permitting energy infrastructure without needless delays. It is important to distinguish the functions of government in the energy sector—granting siting approvals, or opening federal lands to energy production, or conferring the sovereign power of eminent domain after judging that a project would serve a public purpose—from the role of government in backstopping the financing of a project. They are two wholly different things and, ironically, while the government appears to accomplish the less desirable function with alacrity, it is often paralyzed in the role of granting approvals merely to allow something to be constructed with a private firm’s risk capital. The administration should underscore that infrastructure permitting and siting is subject to a routine process under the law. Arguments against the development of linear infrastructure are becoming more risible by the day. Recently, opponents of the Dakota Access Pipeline argued that the Religious Freedom Restoration Act should bar the pipeline’s development, because in Lakota prophecy a great black snake was foretold to come into the land and poison the water supply; it would violate the indigenous religion to allow the pipeline—this black snake—to be constructed. (A judge declined to grant a preliminary injunction on the basis of this argument, whose merits remain pending.) There is a huge risk that the infrastructure ambitions of the United States will end up like Canada’s, where the concept of “social license” has become popularized. “Social license” is the idea that, in addition to whatever black-letter legal standard must be met to get a government permit, there is some unquantifiable social acceptability a project must obtain in order to be constructed. Government agencies in Canada are now directed to treat this requirement as a serious object of their inquiry. This is both absurd and lawless. Although a president’s occupancy of the White House is temporary, the infrastructure projects his administration approves are long-lived and often transformative. President Trump and his State Department have already approved important pipelines that increase the supply of oil from Canada and the Bakken shale formation, while President Obama endlessly dithered before his unseemly capitulation to a public lobbying campaign that happened outside the formal administrative process. The FERC likewise is poised to approve gas pipelines, which are within its exclusive jurisdiction. President Trump’s Energy Department should do the same for electric transmission lines, where it possesses siting authority. (States have primary authority in this matter.) Wherever possible, he should require that his functionaries at the Department of Agriculture (which controls the U.S. Forest Service) and the Department of Interior (which controls the Bureau of Land Management and other public lands agencies) approve the use of public land for such projects. It is unreasonable that it has become easier to site public utility infrastructure on private land, using the threat of eminent domain, than on lands within the federal estate, which are mandated to be used for public purposes. For the coal industry, which President Trump has promised to promote, the lucrative markets for the fuel are increasingly in Asia where natural gas is less available. Therefore, Trump and his officials at the U.S. Army Corps of Engineers should approve coal-export terminals in West Coast states which have been pending for years. If government is going to use its authority to allow businesses to charge the costs of their projects to captive customers, or to loan out money on favorable terms to developers, it is far better that it use this authority for energy transmission and transportation infrastructure, rather than for sources of power production. After all, we expect public highways to be paid by gasoline taxes; we rightly have less toleration (though, in the prior administration, still a large measure) for the subsidizing of the automobile itself. Electric transmission and pipelines are by law open-access facilities to all producers, not just some. These transportation projects can tacitly benefit certain production resources, but at least they do not overtly select them. Other initiatives require legislation, but actually they are few and far between in the energy sector. The promised reform of the tax code could extirpate remaining energy subsidies, or—if subsidies are inexorably part of the agenda—they could be expressed not on the basis of production of megawatt-hours but on the actual object that renewable and low-emissions policies have: emissions. This is a more complicated tax policy to administer, but there are tools that allow a developer of an energy project to understand his project’s effect on the total energy portfolio. Likewise, the arcane federal licensing process dealing with hydroelectric projects is largely a statutory matter whose reform should be a less controversial item to tackle. It takes the better part of a decade, or longer, to license these projects, and they are the reductio ad absurdum of a stakeholder-controlled process where everyone gets a slice of the action, but which loses focus on more important items. California’s Oroville Dam, which catastrophically lost its spillway in a time of high runoff this spring, has more words in its license devoted to the maintenance of waterfowl brood ponds than for the early-warning system to alert nearby communities of impending dam failures. Likewise, the National Environmental Policy Act, which sets up the process by which applicants obtain an Environmental Impact Statement, needs reform: it should include mandatory deadlines for agencies and reducing extraneous inter-agency review that enmeshes good projects in a bureaucratic morass. There is, in short, much that the Trump administration can do to improve the industry and benefit the customers who depend on it. So far, his energy policy has been repealing a hodgepodge of administrative regulations of the prior administration. These are good moves, but they fall short of a cogent energy policy. Like his predecessor, who recognized, cynically, that the administrative state was at its most powerful on topics related to energy, Trump would do well to acknowledge the same: not for the sake of the administrative state’s apotheosis, but for the unraveling of its intimate relationship with this monopoly industry. 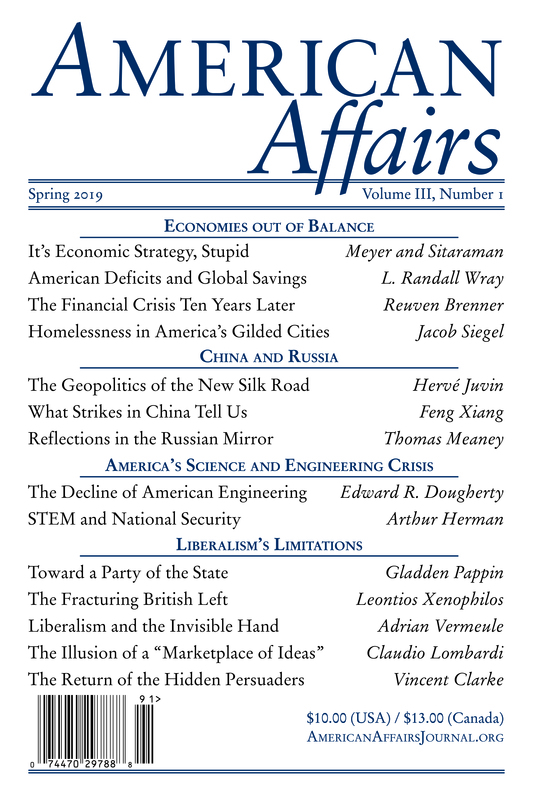 This article originally appeared in American Affairs Volume I, Number 2 (Summer 2017): 126–50.